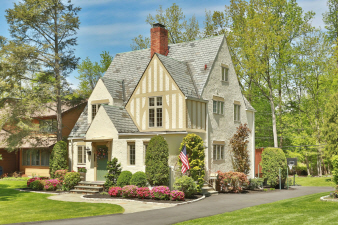 Enchanting in Philipse Manor - this charming 3 Bedroom home in Sleepy Hollow with Slate Roof is picture perfect. Immaculate tudor style home in move in condition. Recent updates including central air throughout, new windows, a lovely kitchen with Thermador walls ovens and large island opens to dining area. First floor laundry room, a den/family room overlooking the pretty yard and sliders leading to deck and level landscaped yard. Short walk to Metro North Railroad, Philipse Manor Beach and Boat Club and 3 parks in the neighborhood. Just 38 minutes by Metro North RR to Grand Central Station NYC. Love at first sight!